Accumulated fatigue makes the driver’ s reflexes dull and slow and triggers unintended physical movements. Vuemate adopts the DSM camera technology that brings the comparison normal driving conditions and abnormal movements into arithmetic operation. It not only calculates the time to close the eyes, a symptom typical of drowsy driving, but also detect any abnormal motions of the driver that deviate from his behaviors done during normal alert and forward—looking driving. A warning sets off with sharp warning sounds and flashing LED lights. Vuemate can be mounted in various locations above the steering column, above the dashboard, or at the base of the instrument panel. Now you can have a top-of-the-line DSM(Driver State Monitor) technology for safety driving that has previously only been adopted for overseas luxury cars, for a fraction of the cost. Sleepy drivers cause dangerous traffic accidents on the road. Drivers may be dozing off at the wheel even now! It has infrared LEDs designed to thoroughly monitor the driveris behaviors in such low light conditions as in driving at night and in tunnels. Drunken driving may be avoided, but drowsy driving cannot. 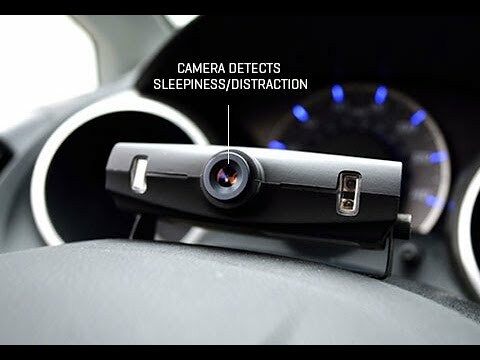 Our Vuemate employs a cutting-edge movement recognition camera technology that can detect your eye movements and monitor the conditions of its pupil real-time and alerting the driver to the danger of drowsy driving in advance. Viewmate represents extremely good value for money, even be alerted once could quite literally be a life saver. Vuemate has a hardware structure rigid enough to provide reliable use in tough conditions. What better gift for a loved one?